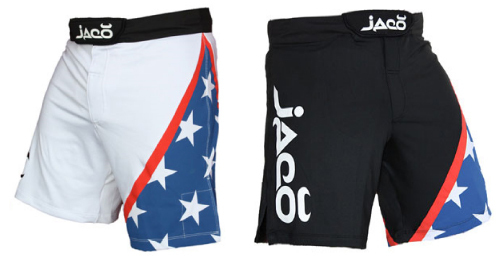 The JACO Resurgence USA Shorts have just been released and are now up for grabs! Part of the Coat of Arms collection including countries such as, but not limited to: The Philippines, Canada, The United Kingdom, Mexico, Brazil, and Australia — The Resurgence fight short was designed with technical superiority in mind. The short has a clean, inspiring look; yet at the same time, is designed to withstand the rigors of MMA competition and training.